The horridly hot weather is no where near over, but this was the last full week of our Summer break.Our past two weeks haven't gone as planned, but things have a way of working out in the end. I'm learning to be less rigid about my plans and more spontaneous. Unfortunately, we have done very little on our United Kingdom study, which we planned to finish tomorrow. We enthusiastically started two Tuesdays ago and were off to a great start. We watched videos of Westminster Abbey and took a virtual ride on a double decker bus. Amber started her UK map book and learned the difference between the United Kingdom, Great Britain, England, Scotland, Wales, Ireland and Northern Ireland. We learned about the Isle of Man too, even though it strictly isn't part of the UK. We are very loosely using the Amanda Bennett United Kingdom unit study on the iPad. So far, we have enjoyed it and found it easy to use. Before completely finishing our first session of the UK study, I received a call from my mom that Dad had taken a turn for the worse and was being put on a ventilator. My dad has been chronically very ill for over 10 years and has end-stage emphysema. We are accustomed to him being in the hospital, but a ventilator is new and worrisome. Our family spent the next few days at the hospital with Mom and my sister's family. Eventually, Dad stabilized and things were looking more positive. Fred, Amber and I went ahead and took our planned trip to Springfield and Decatur, Illinois last weekend. Fred wanted to visit some friends up that way so we made a family weekend trip of it. We stayed overnight in Springfield and visited several Lincoln sites. It was a very well timed trip since Amber is currently studying the Civil War period. 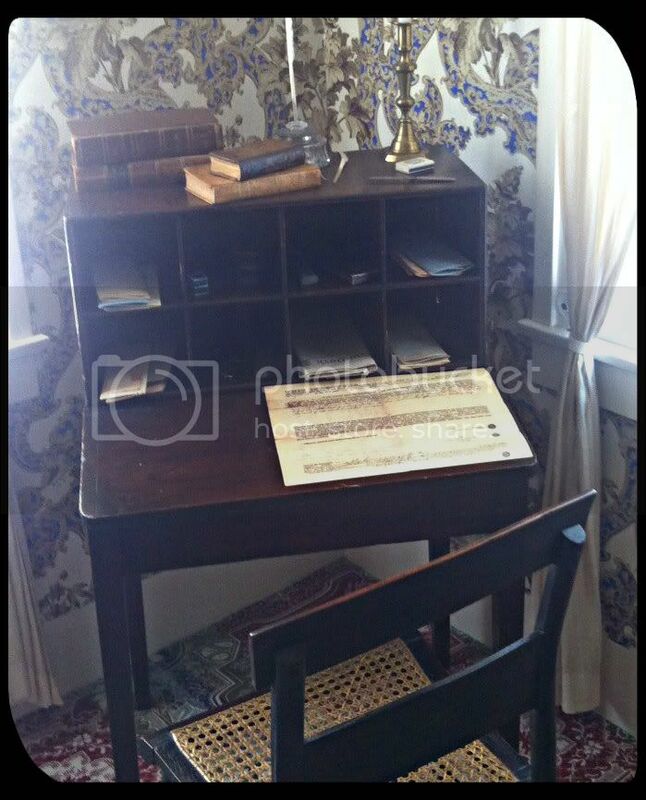 We took a tour of the Lincoln home and learned all about how the family lived while in Springfield and even how President Lincoln was notified he had won the presidential election. President and Mary Lincoln were also in the backyard answering questions for everyone. 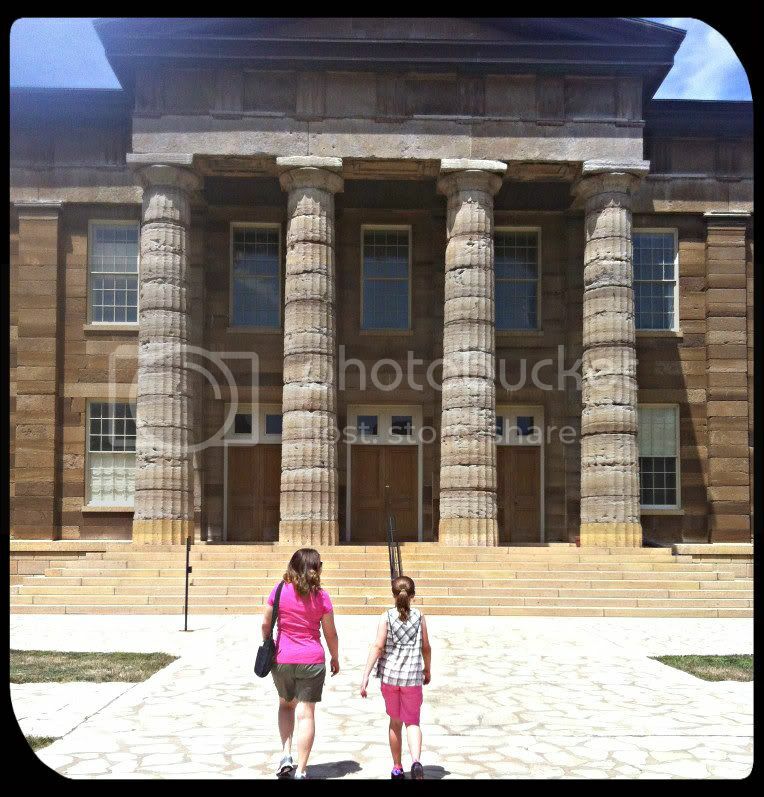 Our second favorite spot in Springfield was the Old State Capitol. It has a nice collection of artifacts and preserved rooms. They happened to have a toy demonstration the day we were there, so Amber learned about the toys children used during the Civil War period. She was so enamored with the Jacob's Ladder that we ended up purchasing one for her. While Fred visited friends in Decatur, Amber and I toured the Scovill Zoo and the Children's Museum. It was terribly hot that day, making for a very uncomfortable visit to the zoo. We did have a nice ride on the zoo train and talked to a very sweet elderly man who was the zoo clown. 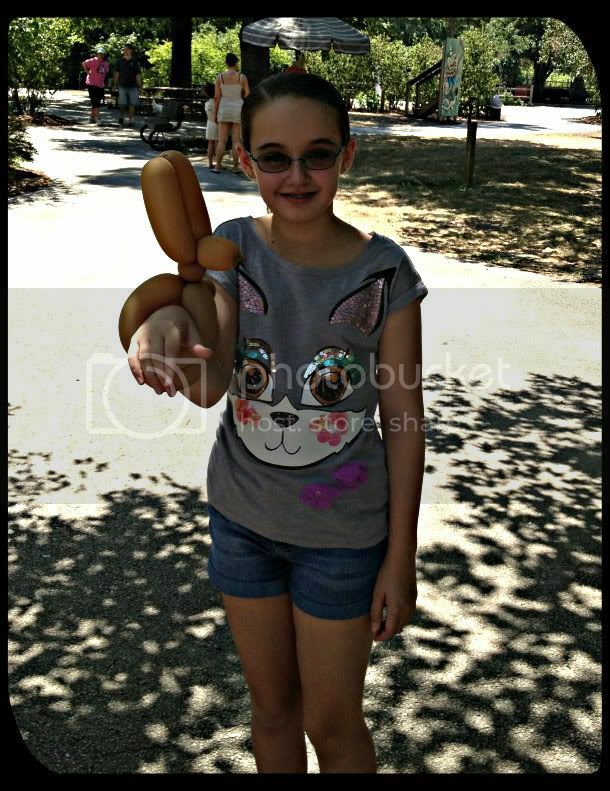 He made us both a balloon animal. Several of the animals were not out because of the heat, and many others looked like they too desired an air conditioned room. The Children's Museum was a huge hit! 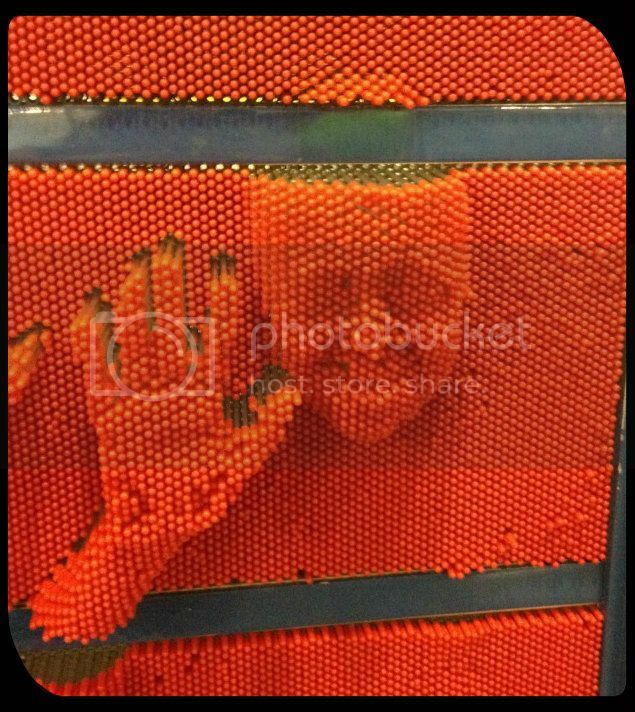 If you have ever enjoyed a visit to the Magic House in St. Louis, then you would like this Children's Museum. It was a smaller version of the Magic House, complete with the same climbing leaves area. 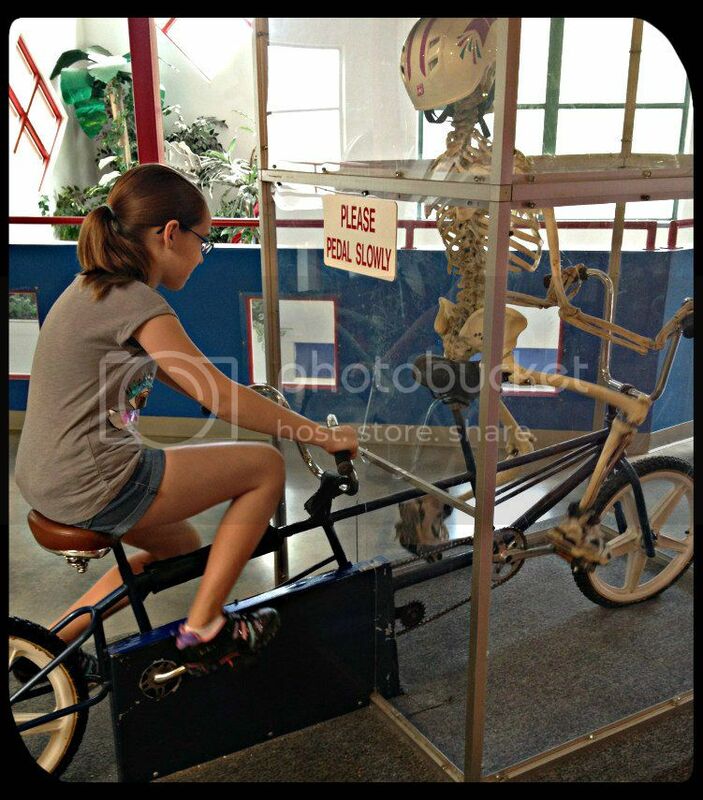 Most of the museum was geared for children younger than Amber, but she still managed to have a great time. During the hours of driving Amber also finished all the assigned summer math! She is officially ready to start Saxon 7/6 for 5th grade. Our trip ended just in time too. We hadn't even closed our house door when my sister called to notify me that Dad needed immediate emergency surgery for a perforated colon. Sunday was a very long night (and Monday morning too). Eventually, we all managed to get some sleep, but Monday and Tuesday were basically a wash for anything productive. We did make a trip to the library this week to turn in Amber's final summer reading sheet. She completed the main part of the Summer reading program in early June and has been working on their extra sheets. 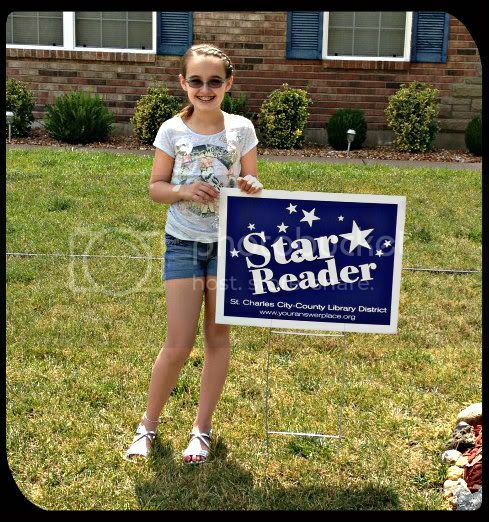 After 9 extra sheets, each requiring 10 hours of reading, she earned the final award - a Star Reader yard sign. We are very proud of Amber and she is over the moon about earning that sign. Amber and I also made a lot of progress in the school room. Random summer papers and trinkets have found homes (many in the recycle bin). The curriculum has been sorted and put on the shelves. We purchased school supplies and they are ready to go. I'm just so thrilled this year that I don't have to label everything with Amber's name. There are just a few small things left to do before school starts on August 1st. It looks like we might be ready in time, after all. I just don't think we are going to get very far in the UK study unless we make it part of our new school year. That's been our last couple of weeks. I foresee more hospital visits and perhaps not as much school work happening as I had hoped during our first couple of weeks back. We will make it work and practice more of that spontaneous life style. We are eagerly anticipating the return to school next week, but also a little sad that the carefree days are almost over. Hopefully, our almost 3 day weekends and lots of breaks throughout the school year will compensate for the loss of the hot summer break. Have a great weekend and enjoy the last of your summer too. So awesome your husband was up for a trip. Glad to hear he is doing good. Thanks! He is almost back to full strength and even keeps asking to mow the yard again. I'm not sure that I am ready to let him do that. Still, he is mostly normal Fred again. We are so thankful for his return to health. I remember visiting that museum when our kids were younger. It's wonderful! Our favorite Springfield stop is Cozy Dog. (We're in Alton.) I pray that your father does well. Of all the places to eat in Springfield, Amber chose Texas Roadhouse. I guess it was something familiar and she doesn't always like change. We eat at our local Texas Roadhouse EVERY Saturday - Did I mention Amber doesn't like change? Your trip sounds like a successful mix of learning and fun! And congrats to your daughter for her achievements in math--it's a major accomplishment to be starting Saxon 76 in fifth grade! She says "thanks". She is excited to do more than coast through math this year.